With all the gargantuan 460cc drivers, this R9 TP is a breath of fresh air with its 430CC head. 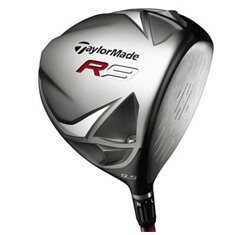 I like this Taylormade R9 TP Driver because it's a more compact club head. What happened to actually trying to work the ball with your driver instead of taking all the spin off of it and smashing it with a toaster oven on the end of a stick? Another cool thing about this driver is TaylorMade's Flight Control Technology (FCT). FCT will give you up to 75 yards of right-left variance, 3 degrees of variance in launch angle and a 1,500-rpm difference in spin; and you have movable weights that help you refine your direction and feel. Bottom line is: If you are having trouble hitting a slice (like a lot of us), simply set the FCT to closed and put some extra weight on the heel. You will start ripping it down the middle. The best part is: once you start to improve, you can always go back to a neutral position, or even open if you are hooking the ball. The only thing I would warn you about this club is the shaft in the R9 TP plays very stiff. Unless you have a fast swing speed, you should go with the regular flex.